David Mosesso has been a newspaper man for more than 35 years now and he plans to stay that way, even in his retirement. board member for the Arkansas Press Association. His three-plus decade career has seen “the best of times” and some of the worst, he said, citing the changing digital landscape and events like the Sept. 11 attacks in 2001 and the 2008 financial crisis. While some in the industry made personnel changes to survive, Mosesso said he was fortunate to stave off wage cuts or furloughs at his newspapers. 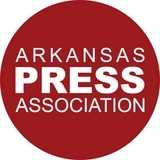 APA now accepting editorial contest entries Entries are now being accepted for the 2019 Arkansas Press Association Better Newspaper Editorial Awards contest. Entries are due by April 19. Winners will be announced at an awards luncheon annual Arkansas Press Association convention at the Hotel Hot Springs in Hot Springs on June 29.
circulation over 2,600. There are multiple categories for news stories, including sports humor and general interest; photography; layout and design and community coverage. Visit the website for a complete set of rules, or for more information, contact Terri Cobb at terri@arkansaspress.org or (501) 374-1500. As Paxton’s group president, Mosesso oversees seven daily newspapers, including five in Arkansas: the Jonesboro Sun, Paragould Daily Press, The Courier in Russellville, Searcy Daily Citizen and Batesville Daily Guard. Though he’s retiring from day-to-day operations, he will continue to write a weekly outdoors/ hunting column and said he’ll be around if needed to help Paxton or his papers. He noted that Paxton may acquire more newspapers in 2019, and he said he’d be available to assist with due diligence or other matters in the acquisition process. Guy Unangst, former special projects editor for the Arkansas DemocratGazette, died March 8 in Jacksonville, Fla., following a sudden illness. He was 75. Unangst was a Pennsylvania native, and he earned a journalism degree from Washington and Lee University in 1965. He was a radio operator in the Army Air National Guard. He was a sports reporter in Norfolk, Virginia, before moving into editor positions. At the Philadelphia Inquirer, he was part of a Pulitzer Prize-winning team. He was an editor at the Fort Worth Star-Telegram before he moved to Little Rock. At the Democrat-Gazette, he served as special projects editor, Sunday editor and Washington editor. He retired in 2009, moving to Florida to live nearby his longtime friend and reporting protégé, Andrea Harter, who had been a reporter for the Democrat-Gazette. Unangst was an “adopted” member of Harter’s family. Naugle Funeral Home in Jacksonville, Florida, is in charge of arrangements. Unangst was an avid bridge player, and a memorial service will be held April 6 in Florida at the Jacksonville School of Bridge. and members of the community. A fellow member of the Jonesboro Rotary Club, Dr. Bob Warner, said in the Jonesboro Sun that Mosesso has been a community leader. “I don’t have anything but praise for him,” Warner is quoted as saying. “I think he’s done a lot for the community over time. All the things that make Jonesboro Jonesboro, he’s been a part of it.” Ashley Wimberley, the executive director of the Arkansas Press Association, said of Mosesso: “David Mosesso is the kind of detail-oriented, hands-on publisher that newspapers really need. 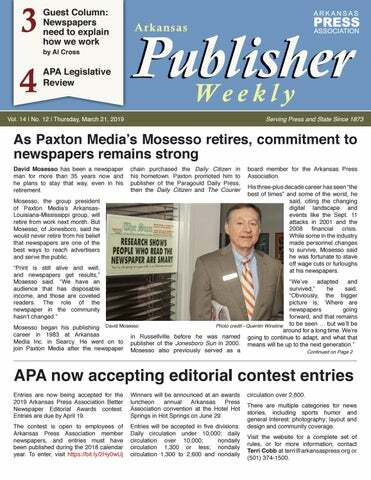 During a challenging time for our industry, David has focused on revenue growth and expansion of Paxton Media’s footprint in Arkansas, all the while providing quality leadership to his teams and to readers of his newspapers.” Mosesso said it had been his goal to retire early. He and his wife, Terricia, will remain in Jonesboro. “Publishing a daily newspaper is truly a miraculous event that we manage to do every day, and I will miss the people and the process dearly,” he told the Jonesboro Sun. Keith Inman of the Jonesboro Sun contributed to this article. if our democratic republic is to function the way the Founding Fathers intended. That’s why they put the First Amendment in the Constitution. It gives us great freedom, but with that freedom comes a great responsibility. If you think we are not living up to that legacy, please tell us.